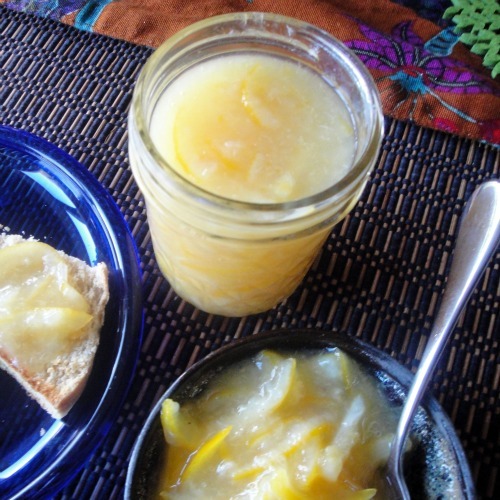 My simplified 5 step version of this Meyer Lemon marmalade recipe is less work than the original recipe and was easy to make on the first try. If you love lemons you'll enjoy this lemony-sweet marmalade, and besides spreading it on toast it can be used in baking to flavor muffins or bread, or as a topping for pancakes. Late fall and winter are prime citrus fruit season in California, and we are happily enjoying an embarrassment of riches thanks to our large, mature Meyer Lemon tree. We inherited the tree when we bought our house here in Silicon Valley, and this tree seems to be loaded with fruit in almost any season. It produces new fruit twice during the year, but these tender lemons are best kept on the tree where they ripen slowly and can be used in cooking in their different stages of maturity. The fruit turns from green to bright yellow, then becomes orange-yellow if left unpicked. As soon as they are slightly yellow we begin to pick! We use lemon juice almost every day in our meals: on salads, fish, vegetables, or fresh fruit. The zest is especially delicious in a number of baked goodies or to add to savory dishes. How is the Meyer different from other lemons? It is less acidic, has a thin skin with almost no white pith (the bitter part on inside of the skin). The Meyer is slightly sweet, very fragrant, and the skin is wonderful grated for its zest or as a candied peel. If you don’t have a yard to plant a tree, the Improved Meyer Lemon is a dwarf that can be grown in containers indoors. 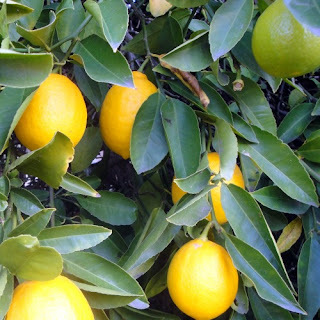 This variety was developed in California after the original Meyer Lemon established in the USA from China was found to be spreading a virus that threatened the citrus industry. Although the Improved Meyer Lemon can grow to 10 feet high, it will stay smaller in a container and can be managed by pruning. 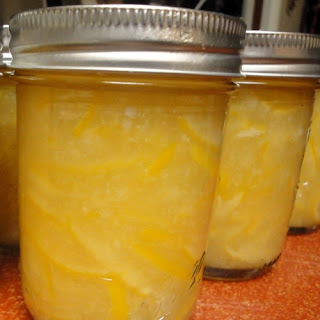 Here is a marmalade recipe I tried last week with good results. My version is less work than the original recipe and was straightforward to make. This is the first marmalade I’ve ever made. It set very well and is lemony-sweet with a hint of bitter to make it interesting. I’ve tried it on my toasted olive oil bread, and even mixed a spoonful with some crème fraiche (or sour cream) to put on top of pancakes with maple syrup- very yummy! Rinse the lemons, dry them, cut them in half and juice them. Set the juice aside until ready to use. 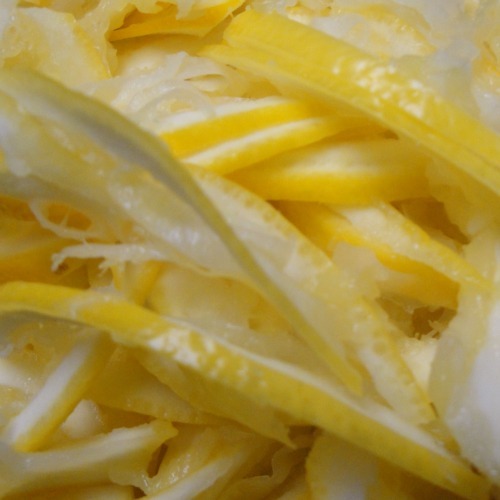 Slice the juiced lemon halves into thin strips, the thinner the better. Note: In Emily’s version you scoop out the lemon halves so that only the skin remains. It took me approximately three seconds to realize I was not up for that amount of work, so in my version you cut the halves into strips without scooping them out. 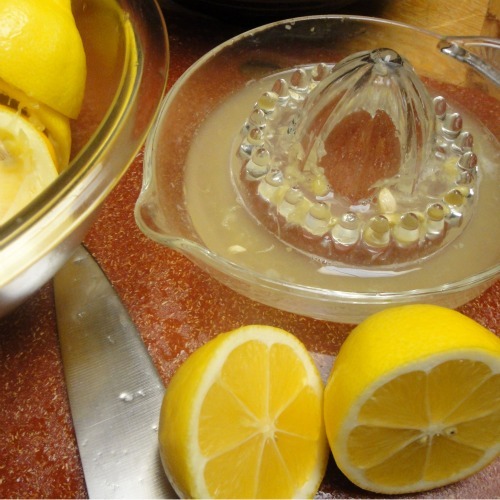 Put the lemon strips in a pot of cold water so the water just covers them. Bring to a boil. Let boil for one minute, pour the strips into a colander to drain them and run cold water over the strips to rinse them. Repeat two more times. The third time don’t rinse the strips, just drain them. Return the drained strips to the pot and add the reserved juice and stir in 3 cups of sugar over moderate heat to dissolve. Let the mixture simmer, stir occasionally to make sure it is not sticking. It will begin to thicken and should set in about 30 minutes of cooking (test by dripping a bit onto a cold plate- it should gel nicely). Put the marmalade into half pint jelly jars (it will be very hot, so don’t use regular glass jars- they might crack)) and put on the lids. Let the jars cool and store them refrigerated, or follow instructions for canning to store them at room temperature for up to a year. See more recipes for Meyer Lemons and an entertaining podcast at Kitchen Window here. With thanks to Emily Kaiser for her recipe. Make the poolish: put 1 1/2 cups of the flour, plus the sugar, yeast and 1 cup warm water into a large bowl. Beat well with a wooden spoon until smooth and silky. Let sit in a warm place until bubbly and foamy, at least 30 minutes. The poolish can sit for a few hours if desired. It gets surprisingly puffy, so make sure your bowl is large enough. Add the remaining flour, 3/4 cup oil, and salt to the poolish gradually, alternating the flour with the oil while you stir until a dough forms. Turn out the dough onto a lightly floured surface and knead for about 5 minutes until the dough is smooth and elastic. It will feel very moist and oily, but avoid adding too much additional flour. The finished dough should be oily but not stick to your hands. This is when you add the fresh herbs, if using. Sprinkle the chopped herbs onto the surface of the dough and knead them in until the herbs have been incorporated into the dough evenly. Grease a large bowl with a bit of olive oil, place the dough inside and cover with the towel. Place in a warm spot until approximately double in bulk. The magazine's recipe allows 2 to 3 hours rising time, but I found that’s not necessary. I often make an accelerated version that I let rise for only 1 hour- this works had has a nice texture. The key is to make sure the poolish has risen well before making the dough. Preheat oven to 400 degrees F. After the dough has been allowed to rise and has doubled, gently turn it out onto parchment paper that you have placed on a baking sheet. Gently stretch and shape the dough with your fingers to form a disk about 12 inches in diameter. Using a small knife, cut out four to five slits about 2 inches long and 1/2 inch wide radiating out from the center of the loaf, like a sand dollar design. Bake the scraps as a little chef’s bonus or decorate your loaf by shaping the scraps into leaves and attaching to your loaf. You can also add walnuts or pecans by pushing them into the surface of the loaf. Cover with the towel until the oven is at temperature, then remove the towel and bake for 15 to 20 minutes. Be careful to watch the time- it bakes quickly and will puff up and start to turn a beautiful toasty brown. This recipe is very forgiving and adapts well if you want to reduce the amount of sugar or oil, vary the types of flour, or the rising times for the poolish or the dough. I routinely make a double batch to get 2 loaves, or I make smaller loaves to share. Other variations I've tried are adding fresh basil in the summer, and even lavender flowers. If you try it I please let me know your comments: did you enjoy it? would you try it again? what variations have you tried? You can find Jerusalem Artichokes, or Sunchokes, at farmer's markets and grocery stores, but if you want a ready supply throughout the fall and winter try growing them yourself. If you like the mild nutty taste, they are great addition to your edible landscape as they are easy to grow. They don't require a large space and make pretty clusters of showy sunflowers. Just a few plants produce lots of tubers to harvest in the fall. Try them sautéed in olive oil with mushrooms and chopped garlic for a quick and simple dish. We loved the creamy texture and earthy flavor; the addition of brown mushrooms makes for a savory combination that will go well on its own or as a side dish. Makes enough for 2 people as an accompaniment to baked squash or other side dish. Scrub any remaining soil off of the tubers with a vegetable brush under running water. If you have trouble cleaning between the bumby parts just break them up. You can peel some of the thin skin off but don't worry about getting it all. Slice the tubers about 1/4 inch thick. Warm up some olive oil in a skillet. Add the Sunchoke slices and cook on medium to low heat so that they don't burn- stir occasionally and cook for about 10- 15 minutes. 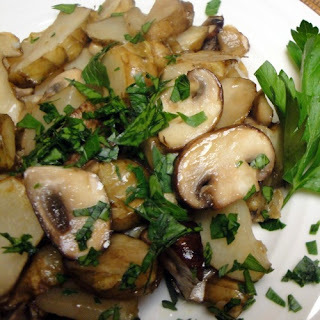 Add chopped garlic and sliced brown or white button mushrooms as the Sunchokes begin to soften. Season with salt and pepper. 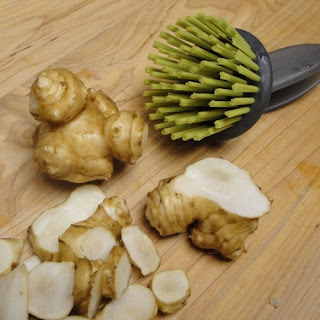 As the mushrooms become cooked thoroughly, test a piece of Sunchoke to see if it is done- it should be soft. You can cook them a bit longer if you like them creamier, or serve them while they are still bit firm. Serve warm with a sprinkle of chopped fresh parsley. This dish is a great accompaniment to other winter vegetables such as baked squash.